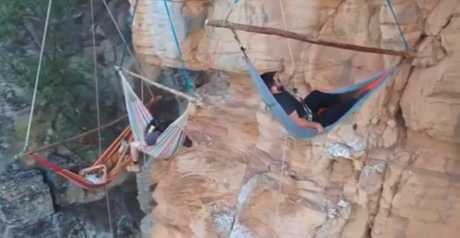 FOOTAGE of three Toowoomba men in their 20s dangling off a cliff in hammocks has been viewed by more than 100,000 people in the past 24 hours. Sunshine Coast man Daniel Prosser captured images and video using a drone and his GoPro this past weekend as his friends scaled cliffs at a location near Murphys Creek. In it, Seth Brumpton, Hayden Whip and Alex Caulfield set up hammocks high above the ground at Red Cliffs and settle in for the night. "We do it to challenge ourselves," Mr Brumpton said this morning. "It allows us to overcome our natural fear response and we get some cool shots along the way." But it's not all swinging in a hammock and watching the stars: Carrying 300m of rope as well as food and water is quite a load. And fastidiously double checking all knots is not for those with a laissez faire attitude. This weekend mosquitoes left the trio alone but they had to contend with the "full moon shining directly in our eyes" - a problem Mr Brumpton concedes most people wouldn't mind having. Mr Brumpton and Mr Whip would go out on similar expeditions almost every weekend until work and study consumed much of their free time. Mr Prosser has headed out with the group in the past for abseiling but had to settle with being ''the camera guy'' on the weekend as he got to the site later in the day. The popularity of Mr Prosser's video though, must be reasonable consolation. 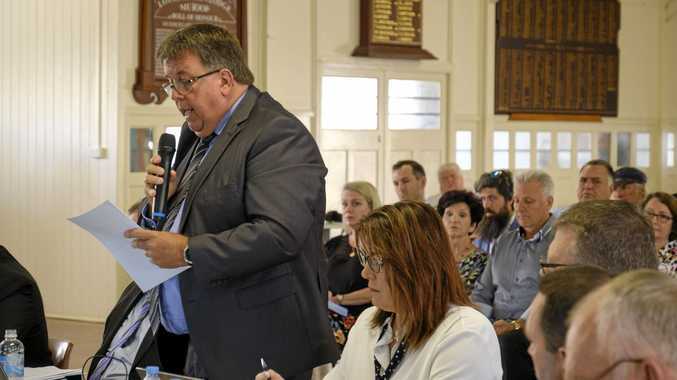 "We've been so surprised by how many people are into it," Mr Brumpton said. "We filmed it for family and friends and to have something to look back on." In the process, they may have inspired others to explore the natural wonders around Toowoomba. And as for being scared of heights? "Hayden's not at all, but I'm nervous enough for the two of us," Mr Brumpton said.